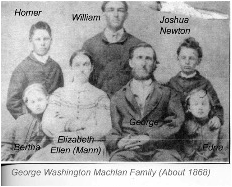 “GEORGE W. MACHLAN is a native of Rush County, Indiana, born November 13, 1832, a son of William and Elizabeth (Stites) Machlan, his father a native of Ohio and his mother of Indiana. He was reared on a farm, but in his youth learned the carpenter's trade, at which he has worked in connection with attending to the duties of his farm. His educational advantages were limited, the district school being his only resource. In 1854 he came to Iowa and made his first purchase of land in Decatur County, and in the fall of 1858 moved with his family to the new home. To his original purchase he has added 280 acres, and now has one of the most finely-improved farms in Southern Iowa, his landed estate numbering 505 acres. He is a public-spirited, influential citizen and a representative man of his township. He has served fifteen years as trustee, and also as clerk of his township, and has been one of the foremost in advancing the educational interest. In politics he is a Republican. His wife and family are members of the Methodist Episcopal church. See notes with his mother, Elizabeth Stites. By 1840 she had re-married to Wm. Selby, and George clearly fits into the head count. So in 1850 this family is headed by Randolph Lee, age 48, and his wife Elizabeth (Stites/Machlan/Selby), age 47. There are three “Lee” children by Randolph’s first marriage; William 16, Peter 13 and Martha 9. 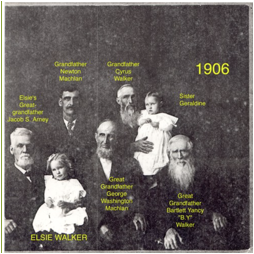 There are two Machlan’s by Elizabeth’s first marriage; Homer L Macklin age 19 (George’s brother), and then our “Geo W Macklin” age 17 -- the two Machlan’s are listed as “farmers” but have attended school within the past year. Finally, there are four children by Elizabeth’s second marriage to William Selby with the last name “Selby” -- Joshua age 14, Eliza age 12, Katherine age 9, and Rachel age 7. Got that? The name is spelled “Macklin” by the census taker. George W. is 27, a farmer, born in Indiana. They have real estate worth $1000 and other estate worth $150. Elizabeth E. is 23. Both were born in Indiana. Living at home are William A, age 6, born in Indiana, Homer, age 3, born in Indiana, and Joshua N., age 10 months, born in Iowa. Note family records say Joshua was born in 1860, but this obviously proves it was 1859! Complete family is found. They have real estate worth $8000, and personal estate worth $2000. Joshua is age 11, supporting the 1859 birth date. The school-age kids have been attending school. Living in the home are George who is 47, Elizabeth is 44, Homer is 23, J. Newton is 20, Edna is 18, Bertha is 16. The three males all show occupation of “Farmer”. George was born in Indiana, his father in Ohio, his mother Indiana (I think). Wife Elizabeth was born in Indiana, and her parents in Kentucky. Of the children, Homer was born in Indiana and all the younger ones were born in Iowa. Only Newton and Bertha are marked as having attended school within the census year. George and Elizabeth are age 67 and 64, and have been married 47 years. She has had 5 children. Both were born in Indiana. His parents were from Ohio, hers were from Kentucky. They own their farm, and have a mortgage on it. George and Elizabeth found, no children at home. FIND-A-GRAVE: Death 25 May 1912, buried in Leon cemetery. See report on her husband George Washington MACHLAN for more info. Elizabeth Ellen Machlan was born in Rush County, Ind., March 21, 1836. Departed this life December 14, 1906, aged 70 years, 8 months and 2 days. Between these dates lies the life history, covering a little more than the allotted three score and ten years -- a period that, looked back upon, seems all too short. Sister Machlan's maiden name was Mann. On August 25, 1853, when in her 18th year, at her childhood home, she was united in marriage to Geo. W. Machlan, who, after over 53 years of happy wedded life, survives to mourn her departure. Five children, three sons and two daughters, were given to bless their home. Two of them were born in Indiana and three in Iowa. They all survive their mother and are present today. They are - William A., of Weldon; Homer E., of Des Moines; J. Newton and Mrs. Edna A. Thompson, of Leon; and Mrs. Bertha L. Britt, of Davis City. Besides these there are twenty-nine grandchildren and three great-grandchildren. In September, 1858, the family, consisting of husband and wife and two children, came to Franklin township, Decatur County, Iowa, where they resided continuously until five years ago, when they moved to the present home at Leon. In that early day, nearly fifty years ago, when they came to the bleak prairies of Iowa to make a home, conditions were vastly different from what they are today. Then the pioneers suffered hardships of which this generation can know nothing. There were no railroads near, no telephone, no rural routes; Ottumwa and Keokuk the nearest points. While the husband and father would go on those long trips to secure supplies for the family, she was the care-taker of the home, at first but a cabin home, but what with honest toil and the blessings of God, they accumulated enough of this world's goods to give her all the comforts of life in her last years. “E.E.” is tabulated in this census as age 14. She was born in Indiana, and has attended school in the past year. She has a younger brother, Jacob, who is age 11. Her mother is Elizabeth Mann, age 47, who was born in Kentucky and who is unable to read or write. Her father is Jacob Mann, age 54, occupation gunsmith, born in Kentucky, with real estate worth $1500.